On February 13, 1942, two U. S. Navy OS2U Kingfisher aircraft were flying together 2,000 feet over the Atlantic Ocean about four miles south of Newport, Rhode Island. Each Kingfisher carried two men. The first, (Bu. No. 5315), was occupied by Ensign Bradley Goodyear Jr., (30), of Buffalo, N.Y., and Aviation Machinist’s Mate 3/c Edward J. Hamner, (20-21), of Long Lake, N.Y. 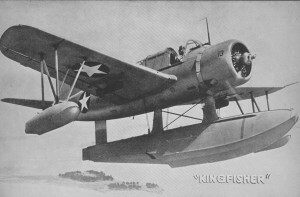 The second aircraft, (Bu. No. 5299), contained Ensign R. M. Nelson, and Aviation Radioman 1/c Reginald Henry Davis, (27), of Hardin County, Texas. For some unknown reason, Ensign Goodyear’s aircraft was seen to enter a sharp left turn at a nose down angle. It continued into the turn for about 270 degrees before it crashed in the water. Ensign Nelson landed his plane in the water where the accident had occurred, and two bodies were seen on the surface. AMM3/c Hamner left the aircraft in an attempt to retrieve them, and subsequently drowned in the process. The cause of the accident could not be determined as the aircraft had sank and was not recovered. Both aircraft were assigned to VP-82. U. S. Navy accident report #3793, dated February 13, 1942.